Who was there: Russell, AndrewB2, Russ, Harpo Mark, Crispy Chris, Will, Groucho Mark, 3 Base-Set Dave, Hairy Martin, Paul, T-101 James, 'Different' James, Jeff, Graham, Gordon - am I missing anyone? A very encouraging third play of Trains for me in as many weeks - this time with my own new shiny AEG copy. Also, in Nick's absence we decided to play using the correct rules. I say 'encouraging' as I probably enjoyed this play of the game, which I lost, more than the earlier two plays of it, which I won. Also the game played out very differently this evening due to the cards/decks available to purchase from. We played using a completely random 8 randomized decks - no 'Tourist Train' this time and also no cards which allowed for 'Waste' trashing, although there were some which allowed for 'Waste' utilisation and hand discarding. Our decks got quite large therefore rail laying a station builds slowed down as decks took longer to cycle, except for Mark's who had so many Control Rooms he was often drawing 11 cards a turn. A highly enjoyable playing and a game I can see playing at home as well as at the EGC. 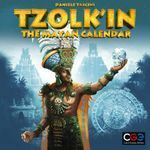 After Trains we tried, and failed, to shoehorn Tzolkin in to the remaining hour and a half. It would have been doable with 3-players but not with 4 and we had to call the game with a couple of rounds to go. The last few turns we did play were a bit rushed and in haste I managed to persuade myself out of buying a monument which might actually have won me the game. Mark and Dave ended so close that had we played through the positions may have been different. Paul had problems with food. Still a very good game - I will get the expansion. With Martin and James scheduled to arrive late, a few of us decided to playa quick game that would finish around 8pm. Jeff suggested Sobek, which was new to me, and while Andrew B2 and Graham had played before, they didn't remember it too well. Fortunately, with Jeff's tuition we were up and running before you could say scarab. In this Egyptian-themed card game you are trying to collect and lay down sets, a little like Rummy, with various options about picking up cards, and special cards and events. After the first round or two we had all picked up how the game was working and the remaining two or three rounds motored along. Andrew didn't keep his early lead thanks to some leader-bashing, and on the final (as it turned out) round, we were all pretty even on the scoreboard. Andrew would have won but as the most corrupt he lost a lot of points; Jeff and Graham both pipped the 100pt finishing line, with Jeff just ahead on 103. Well played, Jeff. A good little filler, nothing too taxing but decisions to make throughout. James (F), Graham, and I broke out the K deck ("complex") for everyone's favourite 17th century farming game. James, it turned out, had a hand stacked full of improvements that required at least three occupations to be built, and he started down that road straight away, building most of his cards during the course of the game. He even had to take a begging card to get all his ducks in a row, bu by the latter part of the game, he had built up enough momentum to look pretty unstoppable. I had a slow start, in retrospect I should have been more aggressive grabbing start player and building my own favourite occupations earlier. I also took some weedy moves, and had to take four sheep, useless to me, to stop James pulling even further ahead of the pack. Wet Nurse gave me an early family growth, and I went into baking in a big way. Graham went early into animals, diversifying nicely as a good all-round farmer, but a little bit late on the family growth. The irony of the game was that James built Constable, giving 5VP to any player who didn't score any negative points at the end. Both Graham and I aimed for and achieved this, but James did not. Still those 5VP weren't enough for either of us. Love this game, I've played it a lot but it can still surprise, and this play of it was very unusual and felt fresh and different. There'd been some interest in playing Terra Mystica so I'd brought it along and ended up recruiting 5 to play. Rules took just over half an hour along with set-up, I always struggle to know when to introduce how power works when doing the rules and the previous time I completely forgot about towns...this time I forgot to explain the flow of the game until the end. Sorry! We took the recommended 5 player set-up, I took the Giants, Will the Nomads, James the Halflings, Chris the Mermaids and Mark the Witches. I gave a bit of basic strategy advice, importance of early temples and points giving favours, which factions probably wanted early strongholds and which cared less about them, places to score points etc. The suspicion around the table lead to almost everyone ignoring that advice; either that or it was just information overload. The game flowed pretty well once the first turn was out of the way, with the usual comments about how although there's a lot of moving parts it fits together sensibly. The occasional confusion about income reared its head and towns proved a point of contention as always; one reason I question the inclusion of the Mermaids in this starter set-up is that it confuses the picture of how you get a town. Things went fairly typically for the set-up, Hobbiton was founded in the usual place, though the mermaids almost managed to cut them off from a second town. I started slow, but managed to build up a better sustaining economy (I should bloody hope so too as I've played it a few times now!) and managed three towns for the first time ever (all town tokens went, the Witches stuck with only one). For a first play I think James in particular played excellently, setting himself up to maximise the various round bonuses, which usually passes people by on their first play. I think if he'd upgraded his spade rate a little earlier he'd have managed a massive explosion of points in the 2VPs per spade round. At the end everyone seemed to have enjoyed it, as did I as ever, and the usual resolve to get another play in quickly descended, but we'll have to see if we manage it (especially as it's looking less likely I'll make it this week...). Having spotted that Jeff had brought down Walnut Grove (as had I) - and having brought it down myself - I was quite eager to play this and we were quickly able to rope Martin in as a third. We were lucky in that the first year had the option that provides us with two tiles. I was first to start and quickly bought one of the only two storage huts in the games, Jeff went for an extra worker and Martin hurriedly bought the second shed. I had a yellow worker, but did not seem able to get any tiles with yellow on them until the fourth or fifth year, so ended up spending coins or begging for food. a lot. I was able to build a very large forest so was able to pay my debts relatively easily. Jeff was playing his tiles very carefully in order to maximise further growth and also went for a third worker quite quickly. Apart from some slight cashflow problems, Martin was managing to stay on top of managing his resources. As we went into the B tiles, everybody had a relatively stable farm, I grabbed a third worker and was just able to grab the bonus tile that rewards you for the largest field before Jeff did, while Martin grabbed the tile that gives you bonuses for each tile. Jeff then grabbed an extra worker with the aim of picking up the well on the last turn. I decided not to grab the well before him on the basis that I would have had to spend 2 gold coins (and 4 points) to do so. The game was new to Martin. After Walnut Grove and with Jeff having to leave, we (Martin, Jeff & Andrew B2) just had time for a game of Hanabi. * This was new (I think) to Martin. I've been greatly enjoying playing this with my children, and Jeff was due to leave for a train, Andrew and I had just short of 40mins, and he expressed an interest in this, I was more than happy to break it out. 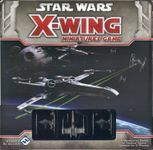 Knowing that the scenarios are what make this (indeed, they are what make most miniatures games), and that a plain dog-fight is somewhat boring, I initially was going to go with the stranded X-Wing scenario from the base set. However, quickly remembering that this alters rules from the base set ever so slightly, I decided for speed and efficiency we would resort to a plain old Core set dog-fight anyway, Andrew then took the X-Wing, and I the two TIE fighters. For relatively even points, Andrew's X-Wing was piloted by Luke Skywalker and he took the R2-D2 upgrade. My TIE's were piloted by Mauler Mithel and Night Beast. I fumbled through the rules of this, normally I rehearse rule deliveries a bit, but this one I hadn't, and it showed! We quickly advanced from our table edges, but remained out of firing range for the first turn. We took neither scores nor ratings as we were pushed for time (in fact this was I'm sure the catalyst in Andrew's decision to flee the battlefield so he could flee for his own bus! ), but I rate this a 9, although this particular play did not showcase the system to anything approaching it's best.